Last weekend, Jackie's Restaurant hosted an acoustic concert benefitting a hospital in earthquake-ravaged Haiti. About eighty people turned up to see a number of local musicians and support the International Medical Alliance, currently providing health care on the border of Haiti and the Dominican Republic. As always, local photographer and friend of JUTP Chip Py was there to capture the event for posterity. Claudia Neuman, lead singer of Sister Ex. Photo by Chip Py. Appearing at the event were over half a dozen local artists, including Silver Spring's own self-described "hook, glam, and dash of punk" Seven Door Sedan, garage band Beatnik Flies, and punk throwbacks Sister Ex, whose lead singer Claudia Neuman picked the charity the money would go to. "Glenn Kowalski of Seven Door Sedan contacted me about six weeks ago wanting to do a benefit with lots of musician friends he (and I) knew wanting to sign on," wrote owner Jackie Greenbaum in an e-mail to JUTP. Greenbaum, who co-owns Jackie's with Patrick Higgins, donated their back room for the effort. Between bar sales, donations made at the door, and matching donations, the event raised over $3,500. Joe Dolan of the Beatnik Flies. Photo by Chip Py. Most impressive, however, was the outpouring of support from the bands. "There is a very cool community of artists and musicians in the D.C. metro area, and Silver Spring in particular, who are activists and have really big hearts," she writes. "Anytime they want my help, I'm happy to support 'em." Greenbaum hopes that more people are aware of the restaurant's frequent community events. "Jackie's does stuff like this all the time," says Greenbaum, noting the art installations, concerts, and other charity events they've hosted in the past. Wow that is really fantastic! I wish I had been able to go to that. I wish to thank all those who made this terrific event possible. My wife and I had just returned from work with IMA in Haiti,the recipients of the funds raised. I had been going back and forth all day as to whether I had the extra energy to drive down from Baltimore for what has become a daily round of fund raising events. 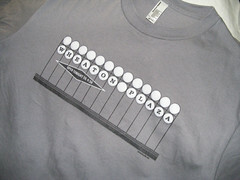 JUTP Store: buy the Wheaton Plaza T-shirt! Our commenting policy: no anonymous comments . . .
Buy it at the JUTP store. 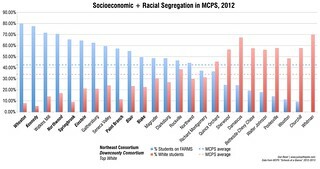 As it becomes more diverse, MCPS is becoming a system of haves and have-nots. Check out our latest series.